Her phone rang and she picked it up without checking the caller ID. “This is Anna.” Her focus was on the seating chart in front of her. “You’re next if you don’t let this go.” a hushed raspy voice warned and hung up the phone. Startled, she looked through the caller ID to see if it showed who made the call. Her stomach felt sick as she came across the number and the name. The killer had taken Tony’s phone and used it to call her. Now, there was no denying that the killer indeed knew who she was and knew she was still snooping into matters…. Event planner, Anna Winters, wants nothing more than to ensure the wedding reception for millionaire Tony Giovani and his beautiful new bride, Meadow, proceeds without a hitch. So far, things have gone exactly as planned. The happy couple’s friends and family have gathered at the Grand Palatial, a posh hotel in Bermuda which caters exclusively to the rich and famous, and are anxiously awaiting the cutting of the cake. Just when Anna is about to call the night a smashing success, the police are summoned to investigate a murder. The cake was poisoned, the groom is dead and suddenly everyone’s a suspect. The pandemonium infuriates Anna’s boss, Mr. Puccio. He’s more worried about the hotel’s reputation than the fact a guest is dead and, to make matters worse, he’s holding Anna responsible for restoring the hotel’s good name. Now it’s up to her to find out who killed Tony or else she’s out of a job. The police order the hotel and its occupants detained until further notice and Anna discreetly enlists a few trusted employees to help with her investigation. Clues are discovered, leads are followed,and it isn’t long before Anna is dangerously close to the truth. But someone isn’t happy about her involvement and Anna has to work fast before she becomes the next victim. 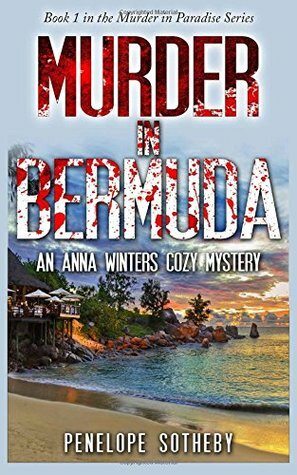 Murder in Bermuda is the first installment in the “Murder in Paradise”cozy mystery series by author Penelope Sotheby.If you are a fan of cozy mysteries that contain an ingenious but modest woman sleuth then you will love Anna Winters’ first adventure. Murder in Bermuda is the first book in the cozy Murder in Paradise mystery series. The series features Anna Winters who is a destination wedding planner who has turned sleuth when a murder happens at her latest wedding. In this first book Anna is busy making sure everything around her at the wedding is going off without a hitch when someone slips some poison to the groom. With Anna’s job on the line she vows that she is going to find this killer but doesn’t expect to be threatened to be next in line. Ok, looking at the title of this novella you would think that it would be right up my alley. I love cozy mysteries and I love destination reads to take a little virtual vacation. However, the first things I notice when reading, there’s really not much to even show that it’s set in Bermuda so disappointment number one. As for the rest of the book I would almost expect to get to the end and think it needed a bit of this or a bit of that with it being a novella but I would hope to still have a good story. However, this one was shaky at best, the dialogue often felt a bit off and the story is barely surface level making this one just not my cup of tea. For many, the thought of childhood conjures images of hopscotch games in quiet neighbourhoods, and sticky visits to the local sweet shop. For Penelope Sotheby, childhood meant bathing in Bermuda, jiving in Jamaica and exploring a string of strange and exotic British territories with her nomadic family. New friends would come and go, but her constant companion was an old, battered collection of Agatha Christie novels that filled her hours with intrigue and wonder. Penelope would go on to read every single one of Christie’s sixty-six novels–multiple times–and so was born a love of suspense than can be found in Sotheby’s own works today. In 2011 the author debuted with “Murder at the Inn”, a whodunit novella set on Graham Island off the West Coast of Canada. After receiving positive acclaim, Sotheby went on to write the series “Murder in Paradise”; five novels following the antics of a wedding planner navigating nuptials (and crime scenes) in the tropical locations of Sotheby’s formative years. An avid gardener, proud mother, and passionate host of Murder Mystery weekends, Sotheby can often be found at her large oak table, gleefully plotting the demise of her friends, tricky twists and grand reveals. Thoughtful review, Carrie! Kudos to you for finishing, and I hope you love your next one! Happy Friday! Ouch, nice honest review Carrie. Probably not my cup of tea either. Better luck next book.